Crisp, clear images of a “hot Jupiter” system captured by a University of Notre Dame physicist were vital in determining that a newly found planet inhabits a three-star system, a phenomenon documented only a few times before. Justin R. Crepp, Freimann Assistant Professor of Physics, was part of the team that discovered KELT-4Ab, a so-called “hot Jupiter” because it is a gas giant that orbits extremely close to one of the stars in its solar system. The discovery was published in The Astronomical Journal. 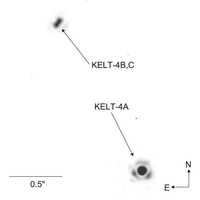 While the KELT, or Kilodegree Extremely Little Telescope, detected the likely presence of the planet now called KELT-4Ab about 685 light years from Earth, Crepp was able to capture crisp, clear images of the system, discovering that the planet was in fact a member of a triple star system — one of only a few found to date. The KELT monitors bright stars in large sections of the sky, searching for planets that orbit extremely closely. When the star KELT-A dimmed every few days, scientists believed they were witnessing an orbiting planet. Crepp was then asked to use the Keck Telescope to investigate and capture photos, and he wound up finding two additional stars in the process. KELT-4Ab, about one and a half times the size of Jupiter, orbits the system’s main star every three days. But the other two stars Crepp helped identify orbit each other once every 30 years while simultaneously orbiting the main star — and the planet — once every 4,000 years. 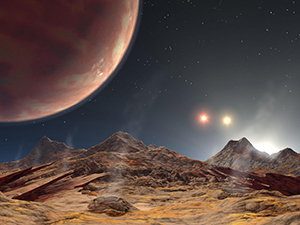 Four planets have been found in systems containing three stars, and Crepp has been involved with three of those discoveries. He and his students discovered the first two. Crepp says that until the mid-1990s, scientists believed that gas giants like Jupiter would be found far from the stars they orbit, much like Jupiter in our solar system. But when the first hot-Jupiter was discovered in 1995, it turned those assumptions on their heads. Since then, Crepp and others have been looking for these “hot Jupiters” to determine how they got there. The researchers believe the presence of multiple stars in a system could be a clue as to how planets finally settle into their orbits. With another gas giant found so close to its star and in a triple star system, Crepp says he and others can now start comparing and contrasting what they’re seeing in other solar systems. “When you first find these, you’re hunting and gathering. Once you have enough objects, we can start looking for patterns,” Crepp says. In a related project, Crepp is developing a tool that would be able to measure the “wobble” of stars as they gravitationally interact with their planets. He is also part of a NASA team that will soon be using the Transiting Exoplanet Survey Satellite (TESS) to find Earth-like planets orbiting in or near the habitable zone of their stars. TESS is expected to launch in fall 2017. Photo Credit (top right): NASA/JPL-Caltech; Artist’s rendition of the view from a hypothetical moon in orbit around a three-star system.